In 1955 an ordinance stated, “That the square located where South Maple Street, Vinton Street and South Willow Street intersects, be officially designated and known…as ‘Arthur M. St. Pierre Square’.” This was approved on 20 March 1956 and signed by Josaphat T. Benoit, Mayor. 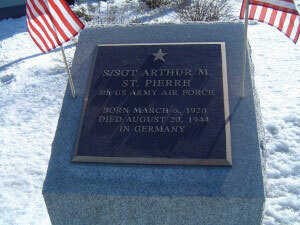 The plaque reads: S/SGT ARTHUR M. ST. PIERRE. 8th US ARMY AIR FORCE. BORN MARCH 6, 1920. DIED AUGUST 20, 1944 IN GERMANY. Arthur Michael St. Pierre was born on March 6, 1920 to Arthur & Mary (Healy) St. Pierre. He grew up on Alpheus Street in Manchester, attending local schools–Bakersville Grammar and Manchester Central High School. Following graduation he worked at the Manchester Die Company. On 20 June 1944 Arthur M. St. Pierre was aboard a Flying Fortress, on a bombing mission, the target being oil at Politz, Germany. The bomber was shot down out of formation by enemy fire, and struck water in the vicinity of the Isle of Regan or the town of Stralsund. A once restricted document to Air Force Command dated June 30, 1944 stated: “crashed (downed) : A fortress, near Kubitzer Fodden West of Ruegen June 20, 1944.” Five men were able to parachute out (they were later captured). S/Sgt. Miles Toepper and S/Sgt. Jack S. Reed attempted to give first aid to St. Pierre and Sgt. Douglas E. Pierce. The report goes on to state that S/Sgt Arthur M. St. Pierre was reported dead, near Thiessow near the Kubitzer Bodden, was recovered dead on June 23, 1944 by the German soldiers who find his body in the plane’s wreckage, and buried him 2.5 km southwest of Thiessow on Reugen, on the beach the same day. 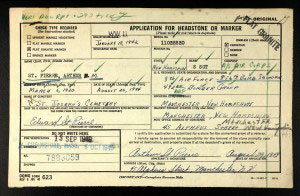 One source I’ve read stated that his body was returned to the family in 1949. I did not find any documents stating this, but I did see that on 29 August 1949 his father Arthur requested a flat granite military marker which was placed in St. Joseph Cemetery, and that his son’s name is inscribed on the family gravestone.